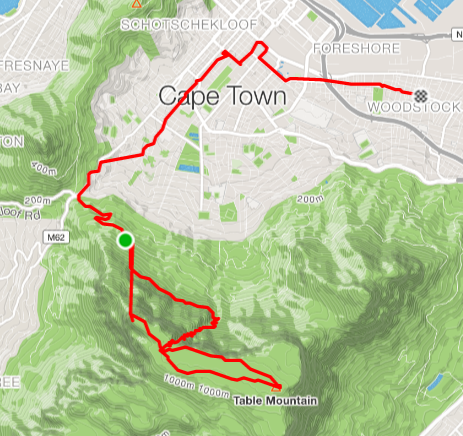 While we were only in Cape Town for a few days, I knew I wanted to both hike Table Mountain, and get a run through town. I decided to combine both one beautiful sunny morning. 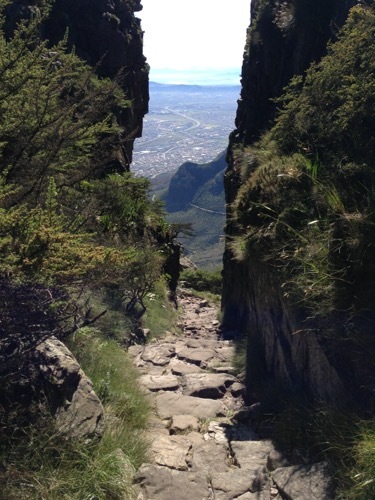 There are many ways to get to the base of table mountain including public transit. I thought about making this a complete circuit and running to and from where we were staying in Woodstock, but it was looking like it would be over 20km, a bit much for my training at the time. In the end I caught an Uber directly to the base of the cable car, and the start of my hike: Platteklip Gorge. While there are many routes up Table Mountain, I chose Platteklip Gorge because it was one of the most direct, safest, and most popular. These last two were of concern to me as I was hiking alone and wanted to err on the side of caution. I was warned by our AirBnb host who had visited the mountain the day before that it was very cold, and by several others that the weather on the mountain could change quickly. As such I packed long pants and warm clothing, a waterproof shell, etc. All this proved unnecessary as the day was gorgeous, and quickly warmed up to a sunny 30C. While I was annoyed that I had a bunch of extra weight for my run back, I didn’t let that spoil my summit. Reaching the top required about 700m of altitude gain, and some traversal of the mountain (you can either start from the cable car station, or a few kilometres down the road). 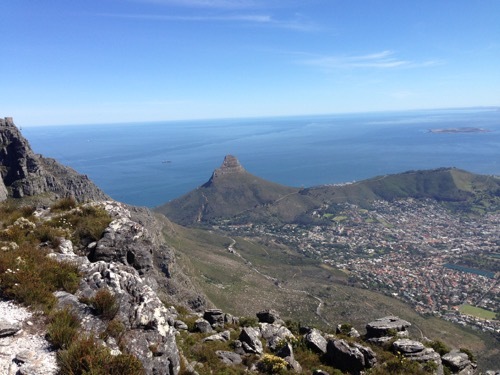 Happily the route up provides amazing views of Cape Town, Signal Hill, and Lion’s Head. The latter two are lower peaks also overlooking Cape Town. The city definitely doesn’t lack for decent hiking! I had considered hiking these other two instead of Table Mountain in case the weather turned bad, but the fates were smiling and I was able to reach the summit. 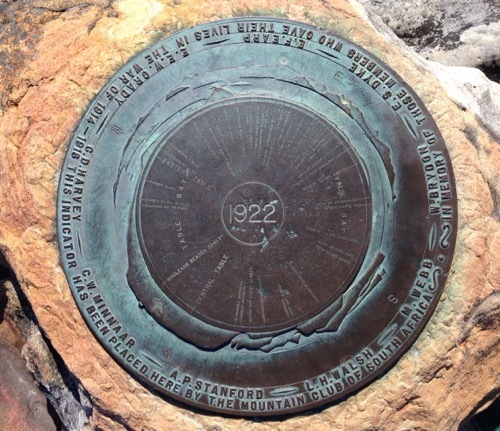 Table Mountain is very aptly named – once reaching the plateau around 1050m above sea level, I still had 2km of mostly flat ground to cover until I reached the actual peak at 1085m. After reaching the peak I ran back to the cable car station, and decided to take the ride down to save my knees for the run home. Once at the bottom station, I had an easy downhill run through the centre of Cape Town. While running down Long Street, I passed the ‘BeerHouse’ advertising 99 beers available, and made a mental note to revisit the area when slightly less sweaty. All told a great hike and run back.